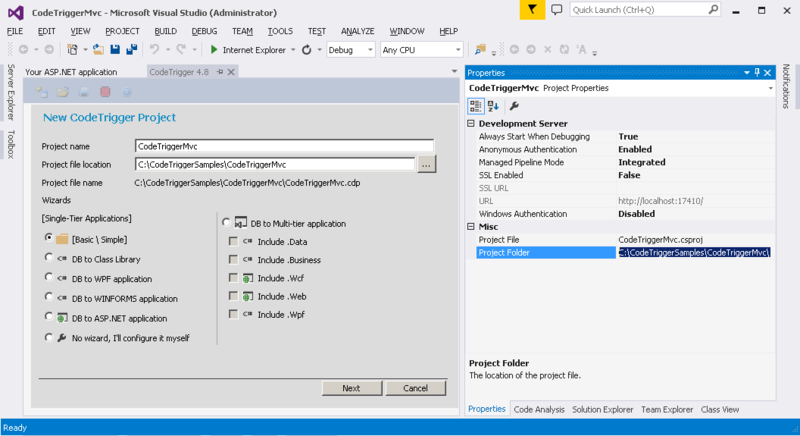 To work with these sample projects you will need CodeTrigger installed, Visual Studio 2010-2015, and a test database with some data. The CodeTrigger sample applications are designed to work with your existing database schema to ensure that the samples are as relevant as possible. Ensure that you have a TEST SQL Server/Oracle/MYSQL database handy. CodeTrigger and its associated supplier companies do not accept any liability for data loss whilst using the CodeTrigger product. It is important that you use a test database until you are familiar with the functionality of the generated code. Open CodeTrigger (from the Tools menu if using the Visual Studio Add-in), Click on the New Project icon in its embedded toolbar, and ensure the '[Basic\Simple]' wizard is selected. 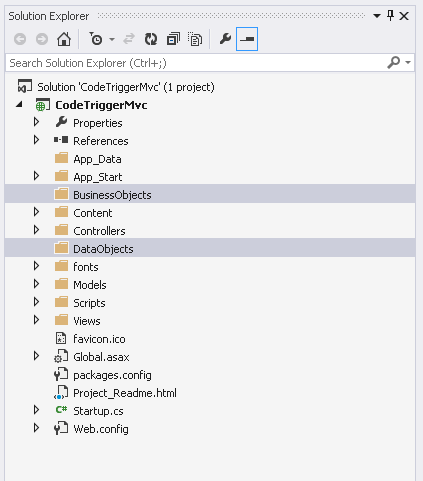 For the purposes of this demo, the project name should be identical to your visual studio project name, ie 'CodeTriggerMvc' The project location should be pointing to the folder where the code for the CodeTriggerMvc project would normally go, as shown in the picture below. It is important to get the name and location exactly right, or the files generated by this wizard might not be in the right place, or might not get added to the project automatically. Enter the details of your datasource, click 'Connect' to verify that you can connect successfully to the datasource, then click 'Create'. 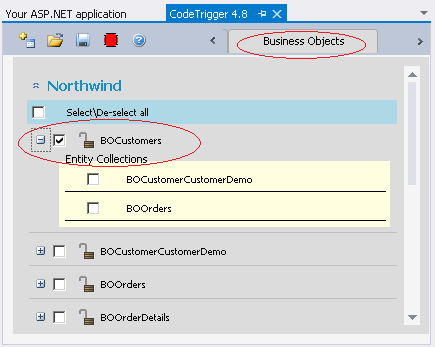 In your Visual Studio project, create a 'BusinessObjects' folder and a 'DataObjects' folders. In the CodeTrigger Menu strip, select the 'Data Sources' tab. These folder paths should match the newly created BusinessObjects and DataObjects folders. 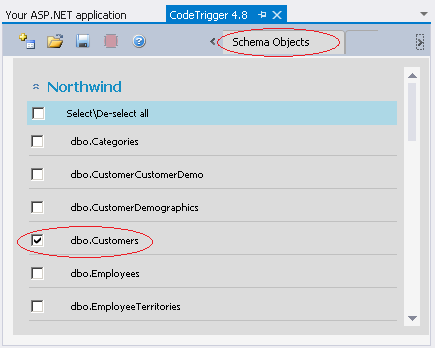 Click on the Schema Objects tab. 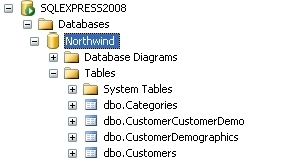 Here you select the specific database entity (dbo.Customers) that you would like to generate access code for, ie select one or more tables from the list that CodeTrigger has found in the database. (For Oracle Users, If the 'Connect' button connects successfully but you have an empty list in the Schema Objects tab, this might be because you have entered an incorrectly named 'Schema' in the field provided, and CodeTrigger is unable to find any entities relating to that schema). Click the 'Generate Code' icon on the embedded toolbar. Thats it. 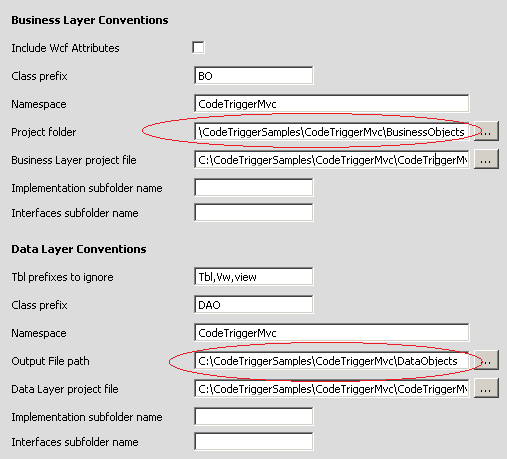 CodeTrigger generates all the code you need for the business layer and data access layer. 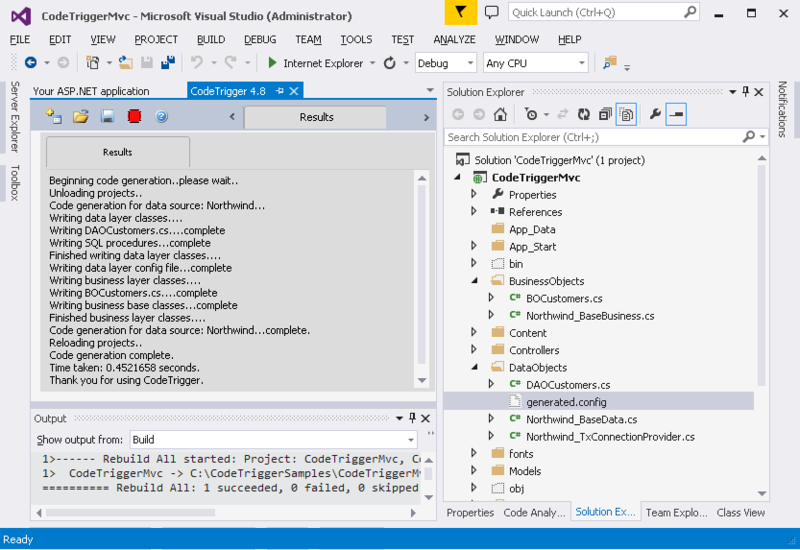 If you cannot see the generated code, select 'Show all files' in your Visual Studio solution explorer, or refresh its contents. You might need to manually include the files in your project. 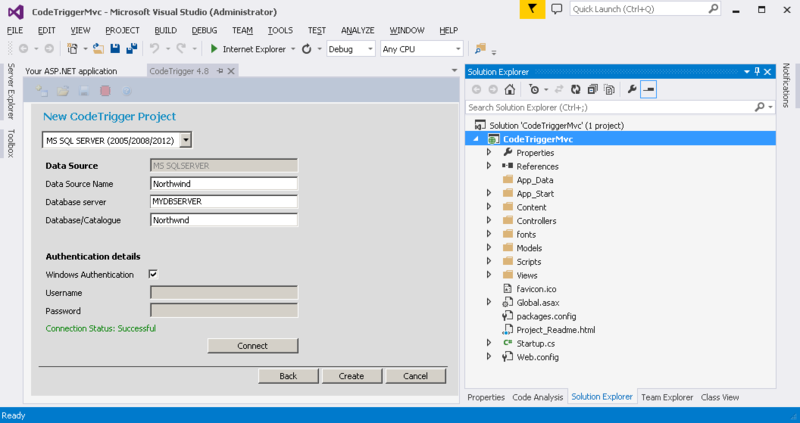 Step 7 - Configure connection string. Open the 'generated.config' file and copy the appsettings section containing the dataconnection string into appSettings section of the Web.config file in your project. Step 8 - Create your ViewModel class. Step 9 - Create your Views. Leave the 'Data Context Class', 'Create as partial view', and 'Use a layout page' options unticked/blank. Step 10 - Ensure the correct primary keys. Step 11 - Create the Controller class. Step 12 - Thats it! Build and run. Hit F5 to run, navigate to the relevant url eg http://localhost:mydevportnumber/customer and list/update/edit/delete your customer entries in your ASP.NET MVC app.